This old four bedroom apartment has been completely remodelled according to the wishes of a family with two kids who enjoy entertaining friends in an informal atmosphere. To accomplish this the apartment had one wall in the kitchen area demolished, and to make it easier to maintain covered most of the others in wallpaper. 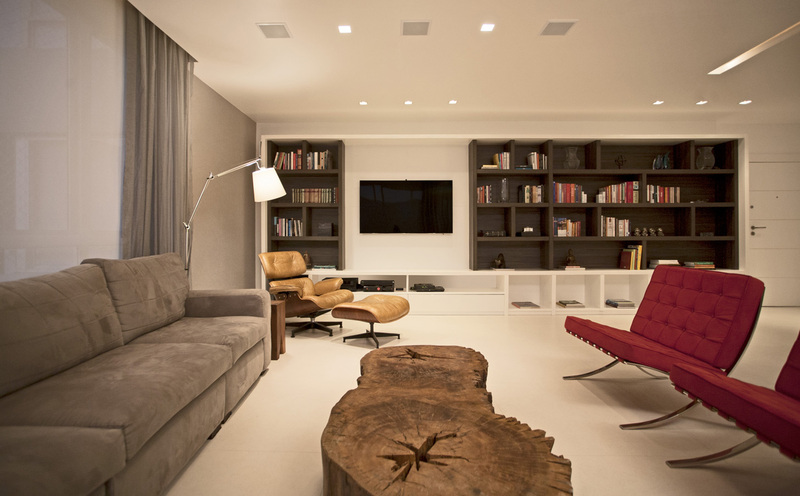 Wooden pieces of furniture in the living room provide an air of cosiness to the property, and the coffee table was specially made out of a unique wooden tree trunk, bringing some rusticity to the room. The wallpaper used in the kitchen, in a citric green stripe pattern, adds a nice contrast to the neutral colours in the other rooms. A mirror was placed on one of the walls in order to create the illusion of a bigger kitchen. Glass sliding doors add a sense of privacy when necessary.